The Lincoln Aviator is officially back. Debuting at the New York International Auto Show at the end of March, the three-row crossover made a big impact. Here’s everything you need to know. The Aviator was a short-lived three-row SUV from Lincoln built from 2002-2005. It borrowed styling from the Navigator, but was smaller in stature. Technically, the Aviator was replaced by the Lincoln MKX in 2006. But the MKX wasn’t a body-on-frame design, didn’t feature a V8, and looked nothing like the Aviator. Those who liked the its more geometric design felt a bit cheated. Now, the MKX is now becoming the Lincoln Nautilus, and not the Aviator, while the Aviator is replacing the MKT (shh – we don’t talk about it). This all reinforces beliefs that Lincoln never properly replaced the mini Navigator. But fret not. It’s back and better than ever. But first let’s look at its esteemed stablemate from which its character has been derived. It’s hard to fault the Navigator for anything. First off, it’s the best looking full-sized SUV in the world (apologies to the Escalade, but it’s not close). The distinctive grille, turbine-esque wheels, transparent rear pillar, and horizontal rear light bar, work together to create a remarkable impression. And the Navigator is just as refined inside. Perfect Position Seats, covered in Bridge of Weir Leather, adjust in over 20 directions Active Motion moves to keep your legs from growing tired over long journeys. Clearly, the Navigator is an exceptional vehicle. But, considering its steep price and physical size it can be difficult to fit into your life or budget. That’s where the Aviator comes in. Under the lights at the New York International Auto Show, the Aviator made quite the first impression. Its sleek, modern, and distinctly aggressive. The new signature mesh Lincoln grille fits the front fascia well, and blends into the sharp LED headlamps. The rear is simple and clean with a long, thin brake light. Under all that sleek sheet metal is a twin-turbocharged engine – possibly the 3.0L EcoBoost V6. It could deliver upwards of 400 horsepower and lb/ft of torque. Of course, this is technically a concept vehicle, so nothing is written in stone yet. We do know there will also be a plug-in hybrid powertrain. This will supplement the high power with exceptional fuel economy. And the electric motor will also fill in gaps in low-end torque for smooth and seamless acceleration. 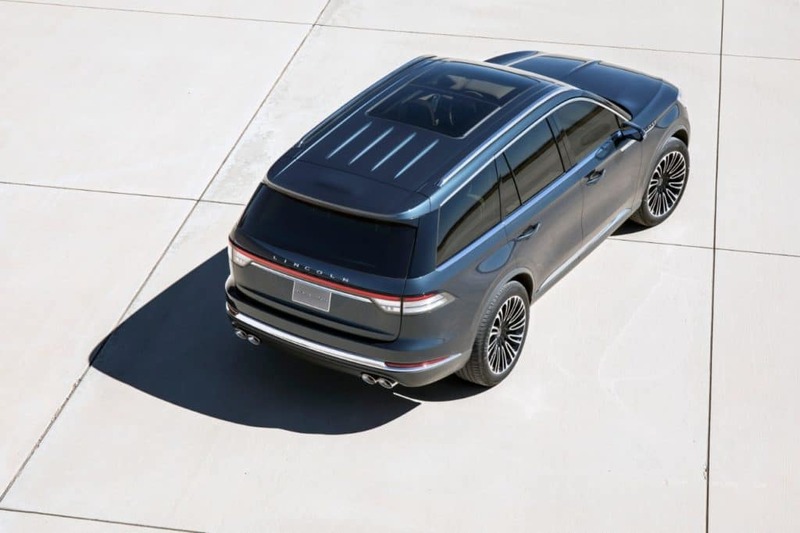 The new Lincoln Aviator will usher in tons of advanced features like Suspension Preview Technology which uses a forward facing camera to scan the road ahead. The information is relayed to the computer which adjusts the suspension on the fly to accommodate. If you’re about to drive over a pothole, Suspension Preview can keep your wheel up to mitigate the impact. Lincoln has also added rear brake assist. It’s the same as popular systems that brake automatically to prevent forward collisions except that it works for collisions behind the vehicle while it’s in reverse. The new Aviator even features the ability to use your smartphone as a key. Lincoln is being a bit coy about the Aviator – it is technically a concept – but we do know the stunning SUV will be available for purchase at some point next year. That will give them enough time to build up their inventory, so they don’t face the same order backlog plaguing the in-demand Navigator.